For those readers who have not got round to reading some of my earlier posts, I thought it might be worth re-posting a previous article dealing with the apparitions of Our Lady of Zeitoun. Although they did not actually begin during the period of Advent itself, thematically, they are the most Christmas-focused of the modern apparitions that have been approved by the Catholic Church. 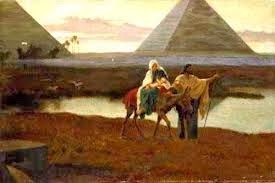 And given the symbolic nature of their content, I believe they are the most important Marian apparitions next to Fatima. 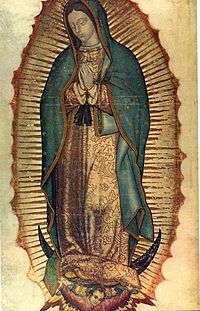 The equation of the Woman adorned with the Sun with the Virgin Mary is a long standing tradition in the Catholic Church, as is attested by the various icons (such as Our Lady of Guadalupe) which depict her as arrayed with the radiance of the Sun, a crown of stars, and with a cresent moon at her feet. This asssociation has recently been re-affirmed by Pope Benedict XVI during his address honouring Our Lady at the feast of the Immaculate Conception on 8th December 2011 (seehere). "There is no offense, however serious, that the Church cannot forgive. "There is no one, however wicked and guilty, who may not confidently hope for forgiveness, provided his repentance is honest. Christ who died for all men desires that in his Church the gates of forgiveness should always be open to anyone who turns away from sin." "Therefore I tell you, every sin and blasphemy will be forgiven people, but the blasphemy against the Spirit will not be forgiven. And whoever speaks a word against the Son of Man will be forgiven, but whoever speaks against the Holy Spirit will not be forgiven, either in this age or in the age to come." Why is blasphemy against the Holy Spirit unforgivable? How should this blasphemy be understood ? St. Thomas Aquinas replies that it is a question of a sin that is "unforgivable by its very nature, insofar as it excludes the elements through which the forgiveness of sin takes place." According to such an exegesis, "blasphemy" does not properly consist in offending against the Holy Spirit in words; it consists rather in the refusal to accept the salvation which God offers to man through the Holy Spirit, working through the power of the Cross. If man rejects the "convincing concerning sin" which comes from the Holy Spirit and which has the power to save, he also rejects the "coming" of the Counselor - that "coming" which was accomplished in the Paschal Mystery, in union with the redemptive power of Christ's Blood: the Blood which "purifies the conscience from dead works." We know that the result of such a purification is the forgiveness of sins. Therefore, whoever rejects the Spirit and the Blood remains in "dead works," in sin. And the blasphemy against the Holy Spirit consists precisely in the radical refusal to accept this forgiveness, of which he is the intimate giver and which presupposes the genuine conversion which he brings about in the conscience. If Jesus says that blasphemy against the Holy Spirit cannot be forgiven either in this life or in the next, it is because this "non-forgiveness" is linked, as to its cause, to "non-repentance," in other words to the radical refusal to be converted. So according to Catholic theology, the only sin which leads to eternal damnation is the ultimate rejection of God in extremis, which the Catechism equates with blasphemy against the Holy Spirit - who works to fulfill the Lord's desire that all men should be saved (1Tim 2:4). Given that the Church teaches that all sin can be forgiven in the sacraments of baptism and reconciliation, we must accept that this forgiveness extends even to the future scenario when people will knowingly and freely accept the mark of the Beast - as long as they repent of their actions and are absolved by a confessor. The widely popularized misconception which holds that anyone who accepts the mark of the Beast faces automatic and irreversible eternal damnation, is solely due to the influence of Protestant theologians during the Reformation. Following the concept of predestination forwarded by John Calvin, a prevailing worldview in Protestant theology is that it is impossible for someone to inherit damnation once they accept Christ as their Lord and Saviour, since they have been granted irresistible grace (which can be summarized by the maxim "once saved, always saved"). Conversely, according to Calvinism, it is equally impossible for someone who has already been predestined to hell to eventually break this path to destruction in order to achieve salvation. This view attempts to explain the repercussions behind the omniscience of God, and asserts that if He knew everything that would happen throughout the course of human history in advance of the act of creation, then God must have predetermined every event that has taken place in the universe. Needless to say, the Calvinistic model of predestination (or double predestination), which teaches that God has already preordained not only the fate of elect, but also those who are damned, has some serious implications for upholding not only the omnibenevolence of God and the universal salvific will, but also the reality of individual freewill. For Catholics, human nature is inherently wounded by original sin, and we are constantly in need of God's grace - which we receive through the sacraments. No one is impervious to sin (apart from the Virgin Mary, who by a singular grace was conceived free from the stain of original sin), and anyone is free to accept or refuse God's grace at any point in their lives. Given that the Catechism teaches that no-one is predestined to hell, and that reconciliation with God can be attained at any point in a person's life, the notion that anyone can be lost forever by accepting the mark of the Beast is incompatible with the teachings of the Catholic Church. The idea that someone can be forever condemned to hell, without any hope of forgiveness, belongs squarely to a Calvinistic concept of salvation. But since this view of predestination is still held by a large number of Protestants, we can see why such a level of fear is attached to the prophecy of the mark of the Beast in some of the most popular books dealing with the end-times. In other words, the mark of the Beast can only ever be whatever the Church will identify it as, and any canonical penalties would only ever apply once the Magisterium has defined them. Building on this scenario from one of the most popular theories on what form the mark of the Beast will take, if a Catholic decided to have a mircochip implant fitted into their hand or forehead tomorrow in order to buy and sell goods, and the Church remained silent on the matter, then there would be no canonical penalties for doing so. As such, there would be no spiritual consequences for accepting this microchip, since it is only the Church that can bind or loose sin on earth. However if the Church was to later teach that accepting such a microchip implant was in fact the fulfillment of biblical prophecy, and that anyone who does so would be barred from receiving communion, then receiving mircochip implants would at that point have a canonical penalty which could prevent someone from attaining salvation if they continued to use it despite the ruling of the Church. They would thus be cut off from receiving the graces bestowed by the sacraments until they repented of their sin, made a resolution never to use such a device again, and sought absolution from a priest. And if they were to die before they repented of their actions, they would be automatically excluded from the beatific vision. Microchip implants would always have been the fulfillment of the prophecy of the mark of the Beast, but the canonical and spiritual penalties would only apply once the Church has made an official decree. The faithful who had been deceived into accepting the mark would then be forced either to choose to make reparation and cease to use this technology altogether, or continue to use it and render themselves unable to approach the sacraments until they repent of their actions. 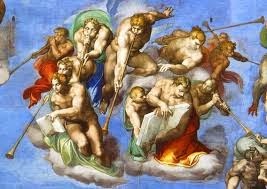 It is worth noting then that the various angels described in the Apocalypse can often symbolize actual figures in the Church. For example, many scholars believe that the oracles to the angels of the seven churches of Asia Minor in Rev 2-3 where most likely originally addressed to the bishops of the respective churches. As such, these oracles addressed to bishops contemporary with St. John contained a prophetic message that transcended the situation in their first century AD context. A famous episode of a historical figure being equated with an angel of the Apocalypse is when St. Bonaventure claimed that St. Francis of Assisi was the angel of the sixth seal - who seals the servants of God on their foreheads (which is a prophecy of the Second Pentecost). 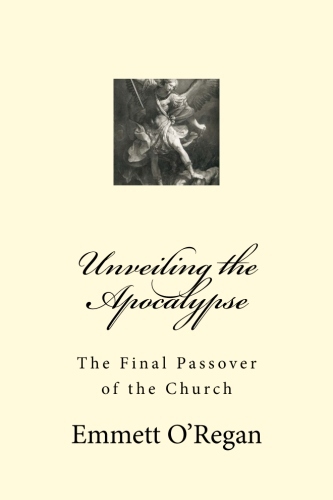 So in all probability, the message of the third angel is actually a prophecy of a Church figure (most likely a pope) making an authoritative proclamation which identifies the exact nature of the mark of the Beast, and the canonical penalties that accepting it will incur - an event which we have already established as an essential component in bringing this prophecy to fulfillment. Transactions through cell phones via NFC technology is widely recognized by economists to be the future of electronic commerce. All such commerce will be conducted over the worldwide web (www) - which has the numerical value in Hebrew of six-six-six. Worldwide cell phone penetration already stands at around 91% (see here) - which means most people in the world already own one. St. John's concept of the mark of the Beast was based on the Jewish practice of wearing phylacteries - small boxes containing portions of Scripture worn on the hand or forehead - i.e. an external object, similar to how a mobile phone is worn. The Greek word translated as "mark" χάραγμα (charagma) can equally be translated as "crafted or sculpted object". Cell phones have an innate capacity for evil, and have already had a negative influence on society. The fact that they are currently used for governmental mass surveillance programs shows the immense benefits such technology will provide for the next global dictator (i.e. the Antichrist), who will exploit this to its fullest potential. With the immanent release of Google Glass, cell phone technology can be worn directly on the forehead. And the beast was captured, and with it the false prophet who in its presence had done the signs by which he deceived those who had received the mark of the beast and those who worshiped its image.